The abandoned American Beauty Electric Irons factory sits on Woodward just south of Grand Boulevard. Behind it can be seen the tower of the Fisher Building and part of the former General Motors headquarters. It is as difficult to conceive of a manufacturer today building such richly appointed factories as were built in the first third of the 20th century as it is to conceive of workers working bathed in sunlight pouring in from immense windows. 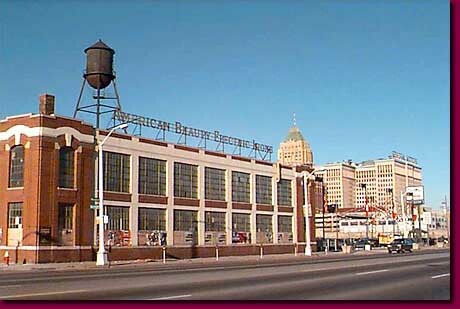 The American Beauty Iron Company manufactured iron in this plant until the 1990's. Its emblazoned name became the inspiration for German film maker Dieter Marcello's award winning 1988 film American Beauty.